I love how this dish turned out for my guests this past weekend. 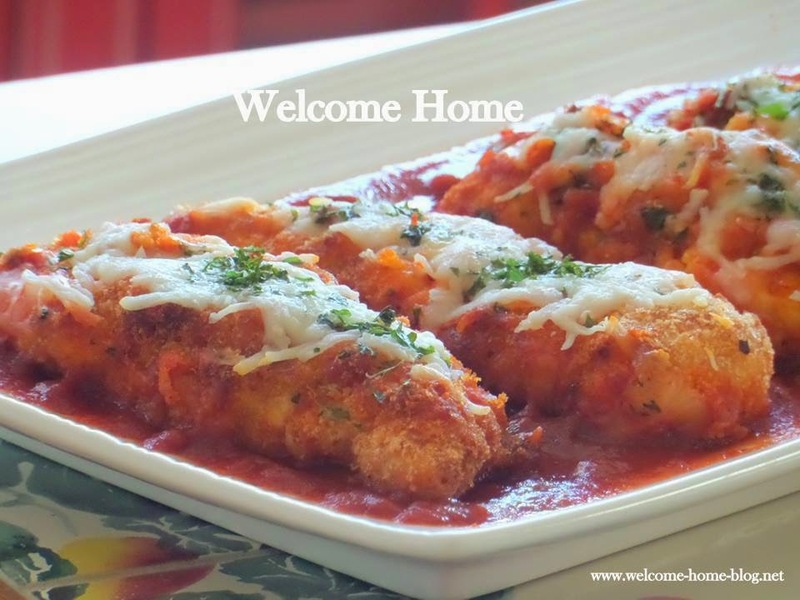 Fork tender, moist chicken coated in crispy Panko breadcrumbs and topped with Romano and Mozzarella cheese. Then served over a delicious homemade sauce. In a medium bowl, whisk eggs. In another bowl, combine Panko, Parmesan cheese, and garlic powder. Season chicken with salt and pepper. Dip tenders in egg, then in Parmesan mixture. Set aside on plate until ready to fry. In large skillet, melt butter and olive oil. Place tenders in skillet and fry on medium heat until golden brown and juices run clear in the center. Remove and drain on paper towel and then place on baking sheet. 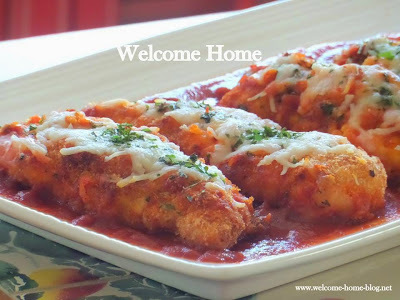 Top each tender with Romano and Mozzarella cheese. Sprinkle with parsley. Bake in 350 degree oven until cheese has melted. Spread 1-2 cups of warm sauce on plate. Then top with chicken. Sprinkle a little more Parmesan cheese on top if desired. Serve alone or with your favorite pasta or make your own (recipe below). In a large saucepan or Dutch oven, heat oil over medium high heat. Add onion and garlic and sauté until soft and translucent, about 2 minutes. Add celery and carrots and season with salt and pepper. Sauté until all the vegetables are soft, about 5 minutes. Add tomatoes, basil, and bay leaves and simmer covered on low heat for 1 hour or until thick. Remove bay leaves and check for seasoning. Add half the tomato sauce into the bowl of a blender or food processor. Blend or process until smooth. Continue with remaining tomato sauce until entire batch is smooth. I make something very similar and serve it with spaghetti tossed in garlic butter, green salad and garlic bread. So good!